The Owenglin flows from a valley in the Twelve Bens, through Clifden where it meets the sea. The entire upper sections is over 9Km long, but it has several different put ins, dividing it into three distinct sections, the Forest section, the Upper section and Simon's Falls. Making it possible to have a trip that could vary from a 9km epic to a park and paddle at Simon's Falls. 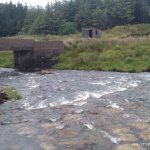 The river has predominately grade 3 rapids, divided by long flat sections, meandering through some of the most beautiful country side Ireland has to offer (take a look at the photos). It also has a technically challenging and dangerous grade 5 drop, with a few grade 3/4 drops and rapids spread out along the river. The Upper Bridge is located in a secluded valley about 8Km east of Clifden. Coming from Clifden take the first left after the "Wilderness B&B", preceded by some bad bends. Coming from Galway, take the first right 200m after the junction signposted for Ballynahinch Castle Hotel. Continue up this road for about for about 2.5Km until you reach the bridge. On the north side of the upper bridge there's an entrance to the forest. Drive about 1.3Km until you get to the river crossing point.This is the put in for the forest section. You can put in here or try to access other rapids on the south fork tributary. Continue across the river along the forest track for about 1km, hop the fence and head towards the sound of rushing water. Located near the end of the upper section, Simons falls can be reached by entering the 'Clifden Glen' estate on the outskirts of Clifden town. Its on the right hand side about 1.5km before you enter Clfiden coming from Galway on the N59. Drive to the very back of the estate. Park there if there is room, try not to block anyone. Then follow the signposted pathway up to the falls. Take out at the bridge on the N59 that crosses the Owenglin just outside Clifden. The forest sections contain several tight technical grade 4 drops, setting up safety and scouting is necessary. The main tributary to the Owenglin or north fork, is wider, usually carries more water and has more drops. However the south fork tributary has some very high drops (14ft), ending in a nice grade two rapid before it joins the main Owenglin. Each of the tributaries or forks has a separate catchment, depending on the direction of the winds and where the rain has fallen, one of these may be running an the other may not. At the end of the main forest section on the north fork there is sheep wire crossing the entire river. In flood this would be a huge risk, make sure to factor this in before taking on the rapid. The upper section starts at the upper bridge. This section starts with predominately grade 2 water, with lots of bends meandering through the country side. After about 1Km the river picks up and there are several grade 2/3 rapids. A grade 3+Â 15ft. drop into a canyon, there's a big pool at the bottom, with the right and left lines being good fun. There's a hole on the river-right lead in to the drop which certainly takes your speed away, and might get a bit sticky on higher levels. Depending on the water level its necessary to scout and set up safety here. You'll want to take photos or video anyway, this area is spectacular. With access up the steep river-left bank making it easy to do lots of runs. After the pool there's a short GII+ rapid. The river continues with some more grade three rapids. This drop represents the largest drop in elevation, dropping about 20ft+. The river reaches a large rock band and splits into two. On river right it drops into a narrow crack that's is almost certainly unrunnable. The main flow goes river left and meanders down a technical grade 5 chute. The drop funnels the water into a narrow chute which means Trojan falls works with surprisingly little water. At the very end ofÂ the chute there's a rock outcrop that needs to be either covered with water or avoided, it has the potential to break boats. Having an adequate safety set up is a must. The drop can be accessed by vehicle in the event of an emergency, theres a dirt track on river left about 50m below the falls that leads to a road off the N59. The Owenglin is a popular fishing river, please avoid this river during fishing season. And if there are people fishing the pools, please portage that rapid or drop. There is a gauge in the water river-left just before you pass under the bridge with black railings, a couple of hundred metres before the take out. This can be inspected during shuttle by walking up the bank. 0.5m is low: dragging over the bed for the most part, but the main rapids still run. 0.8m would be a good level. The level at Simon's falls or the Upper Bridge will give a good idea if it is going or not. Previous photos of the levels at these places will give a good indication. - Trojan Falls can pose a lethal risk, set up adequate safety. - The Forestry section and below Simon's falls can have wire and other debris blocking the river. - Below Simons Falls, a bit after the main rapid but before the get out, be careful of a protruding iron bar at some levels. -It can be a long paddle that can take lots of time, allow time to ensure adequate day light.